In celebration of Randy Weston‘s 90th birthday, Wednesday, April 6 – which included a joyous surprise birthday party at a restaurant in Brooklyn – and in recognition of April as National Poetry Month, we remember Langston Hughes. Randy and Langston Hughes had a longstanding friendship and professional interaction that actually started in the Berkshires in the late 1950s when they met after one of Marshall Stearns roundtable programs at what became the legendary Music Inn. 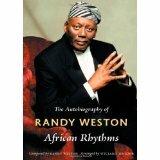 In commemoration of both Randy’s 90th and Langston Hughes, the quintessential American poet, here’s an excerpt from Randy’s recollections of their relationship, including an excerpt from the liner notes Langston wrote for Randy’s classic album Uhuru Afrika, and a humorous anecdote from Langston’s funeral service, that is taken from African Rhythms, The Autobiography of Randy Weston (Duke University Press; now available in paperback edition) that I had the great honor of serving as Randy’s collaborator. Over the years since we first met in the Berkshires, the great poet and writer Langston Hughes and I had become friends. Marshall Stearns brought Langston up there to speak at one of his programs, which is how we first became acquainted. Langston eventually wound up participating in our history of jazz presentations a few times as narrator, the same concept that first came from Marshall Stearns. These programs were structured so that we would play different pieces to illustrate the various evolutionary steps in jazz history and Langston would do the reading. We took the music on a trip from Africa to the Caribbean, then the black church, the 1920s and people like Ma Rainey and Bessie Smith, then on to the swing era. I particularly remember once when we performed it at City College with Booker Ervin on tenor sax and Langston. Years later Langston eventually introduced me to two women who assisted us in the development of our black musicians’ organization, which we called the African American Musicians Society. These women were Ramona Lowe and Adele Glasgow and they worked with Langston, though I think it would be unfair and somewhat belittle them if I were to refer to them as his secretaries. These two sisters, who lived downtown at the time I met them, had a strong desire to move to Harlem, and eventually they opened a place in Harlem called the Marketplace Gallery on 135th Street and 7th Avenue, near where the famous club Small’s used to be. But before moving to Harlem they enabled me to lease their apartment in a building on 13th Street and Third Avenue, which was my first time living in Manhattan. This apartment was pretty impressive, with six huge rooms for only $76 a month rent. In this apartment they had one room loaded with nothing but books. These were two very literate women and through their many contacts they helped us organize the African American Musicians Society, and the Marketplace Gallery became our meeting place. 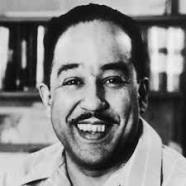 Langston Hughes was important to us in many ways, including in the formation of the AAMS. He used to attend some of our meetings as well and was very interested in our cause as musicians. But back to the development of Uhuru Afrika: I went to Langston and asked him to write a freedom poem for the introduction to the suite, which would have four parts. He was as excited as I was by the prospects for this suite, so he eagerly agreed to write the poem. The poem which we later had translated – a point I’ll get to in a minute – became a sort of invocation for “Uhuru Afrika.” It was a key element in the “Uhuru Kwanza” movement of the suite. I also asked Langston to write lyrics for a section I wrote for African women called “African Lady,” which became the eventual second movement of the suite. Langston’s poem set an absolutely wonderful tone for that recording session. Remember, the whole point of “Uhuru Afrika” was to talk about the freedom of a continent; a continent that has been invaded and had its children taken away, the continent of the creation of humanity. And Langston felt that, he knew it deep down in his soul. in variations of its present form, dates back some 250 years. Millions of fingers have rippled the keys since then. playing emerge from that ancient instrument. After “Uhuru Afrika” Langston and I stayed close. In fact when he died in 1967 at a French hospital in New York his secretary called and said “Randy, in Langston’s will he wants you to play his funeral with a trio.” I thought ‘man, Langston is too much!’ They had some kind of religious ceremony someplace else, which I was unable to attend. But the ceremony Langston really wanted and had specified in his will was at a funeral home in Harlem. It was a big funeral home that seated over 200 people with chairs on one side of the place. In the other room was Langston’s body, laid out in a coffin with his arms crossed. The band was Ed Blackwell, Bill Wood and me. They had arranged for us to play in front of the area of the funeral home where the guests sat, surrounded by two big wreaths. Ed Blackwell got very New Orleans, very superstitious about the setting. He said “man, I’m not gonna touch those flowers. It’s weird enough we’re here in the first place.” So we had some guys move the flowers so we could set up the band. The people filed in and had a processional to view Langston’s body. Lena Horne was there, so were Dr. Ralph Bunche, Arna Bontempts and a whole lot of dignitaries. We set up the band and I went outside for a minute to get a breath of fresh air. Langston’s secretary came out and said “OK Randy, its time to start.” I said “where’s the minister?” He said “there’s no minister, you guys start the service!” I stayed up all night the night Langston died and wrote a piece called “Blues for Langston” because I knew he loved the blues more than anything else in the world. He and Jimmy Rushing, those two guys really made an impact on me about the importance of the blues and what the blues really meant. ← The Voice of Jazz gets downright indignant!